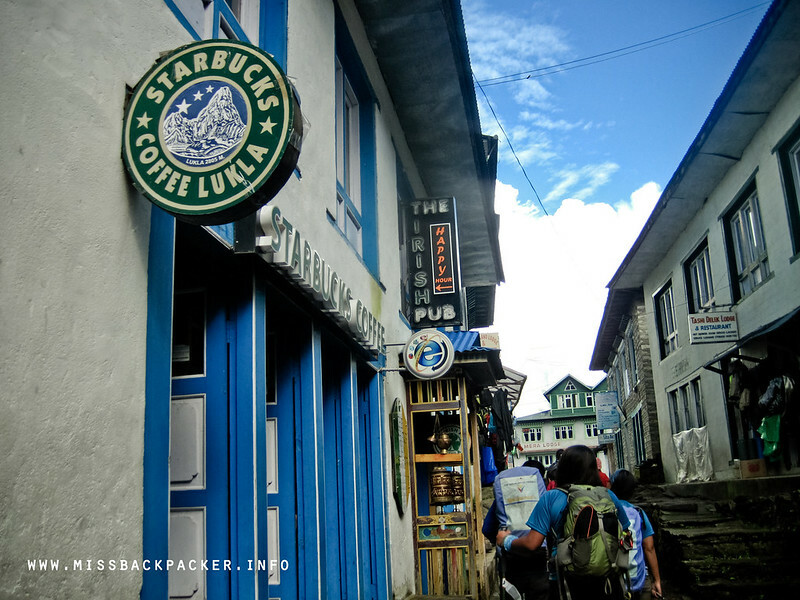 EBC Day 1: Lukla to Phakding | Where Have You Been Lately? When an activity commences (regardless of its kind), all involve are in high spirits. But how can you maintain such energy if that activity will last for 14 days? This is Day 1 of 14 of our Everest Base Camp trek. There are two ways to reach the main jumpoff points of Mount Everest from Kathmandu. One is by bus via Jiri and the other is by plane via Lukla. Many choose to fly to Lukla despite being known as the world’s most dangerous airport because it saves you time, which flying time is just 45 minutes. 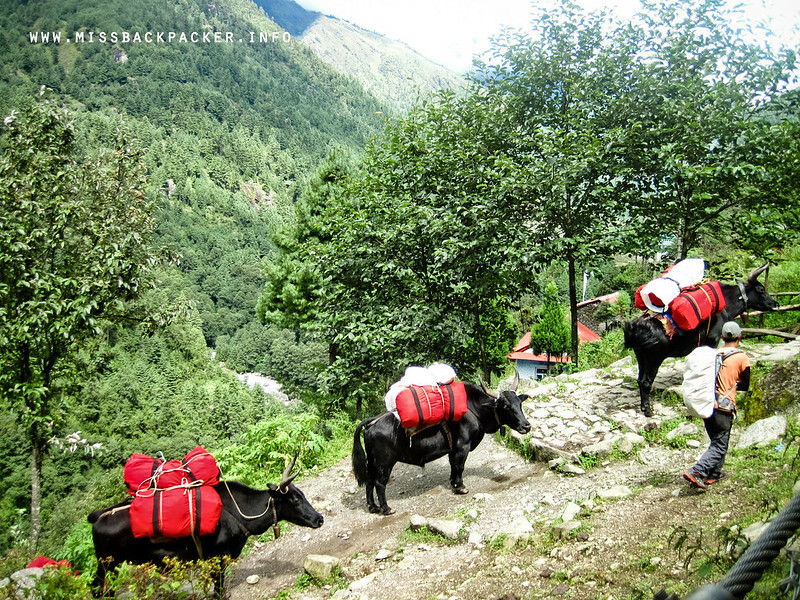 From Jiri, it’d take a trekker eight days to reach Phakding, the next stopover after Lukla. Sorry to rain on your parade, coffee lovers. This one is a faux. 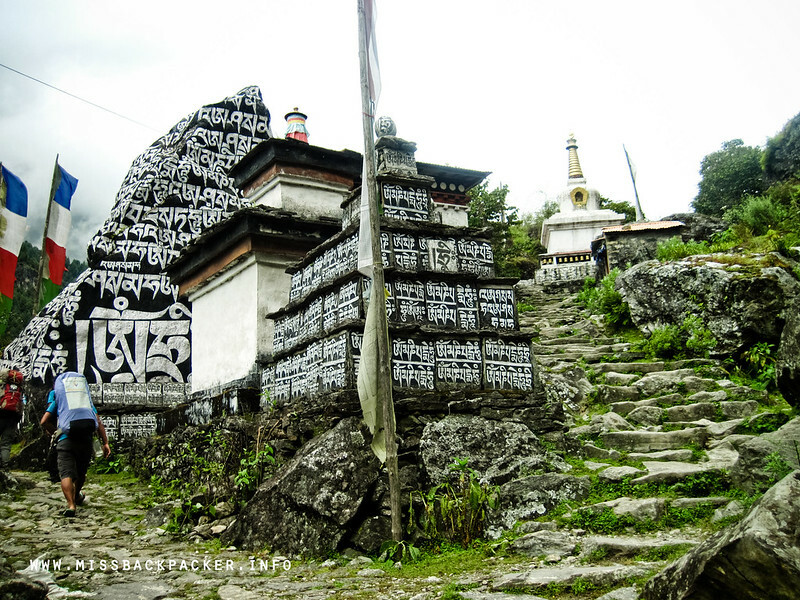 Round-trip fare from Kathmandu to Lukla is around $320. Many say that though taking the Jiri route requires more time, it will save you money. I beg to disagree. If one is choosing to ride to Jiri and trek for eight days before reaching Phakding, how much money do you think it’d cost you from the bus fare to food to teahouse rental? Do the math. And so we chose the route to Lukla. 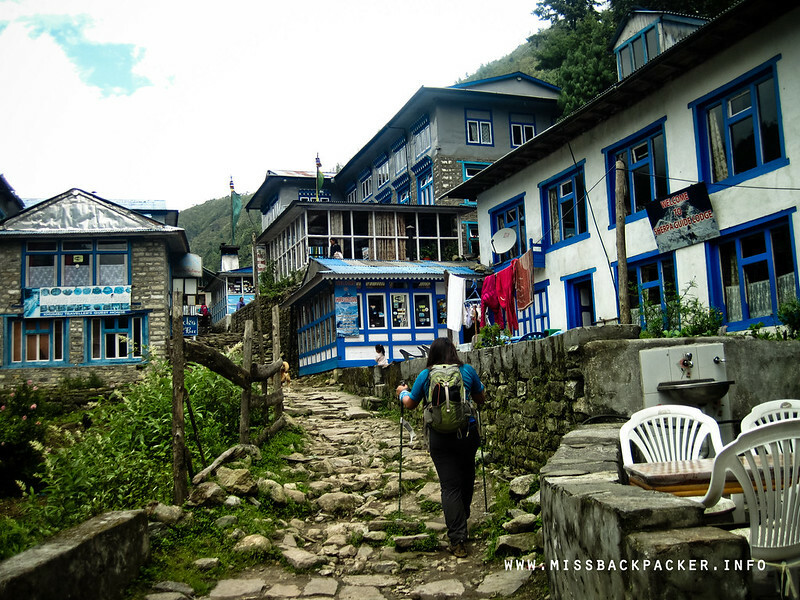 In Lukla, trekkers must obtain and present permits here. After that I-still-almost-can’t-believe-this moment in Tenzing-Hillary Airport, we were brought to a teahouse named The Nest at Lukla for our first breakfast in the Khumbu District of Nepal. The teahouse is not different from the teahouses in the Annapurna region. Makeshift couches, long tables, and the menu. With little options, most of us went for the continental breakfast: egg, bread with butter and jam, potatoes, and a hot cup of coffee. 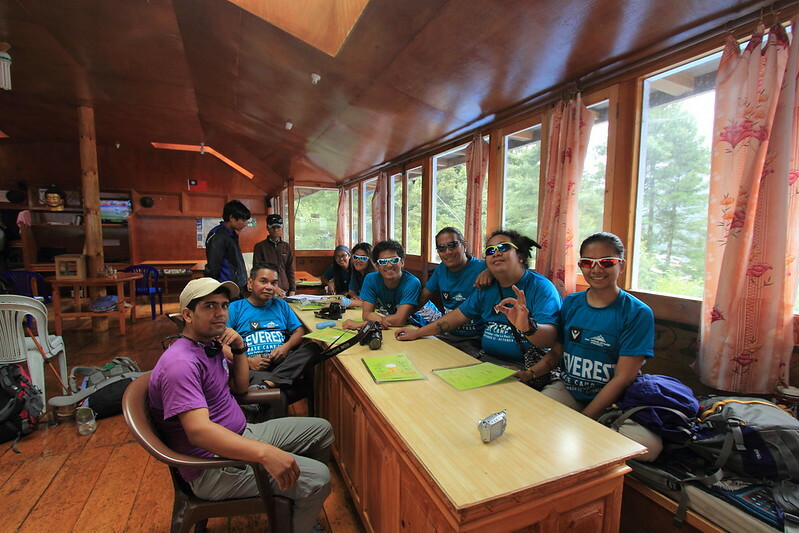 After finishing everything we ordered, Bikal, who fetched us from the Tribuvhan International Airport and flew with us to Lukla, then introduced us to the people who would be completing our team—Saroj, Ramkaji, Kiran, Man, and Manu. We learned that porters and guides aren’t just porters and guides. They have ranking as well. 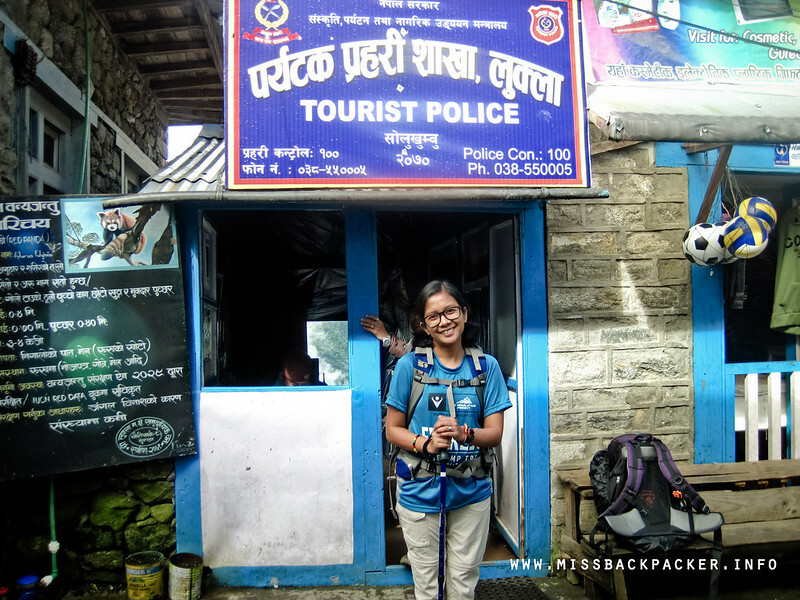 Bikal is a trekking guide, Saroj is an assistant guide, Ramkaji or Rambo is an assistant guide-slash-porter, while Kiran, Man, and Manu are all porters. 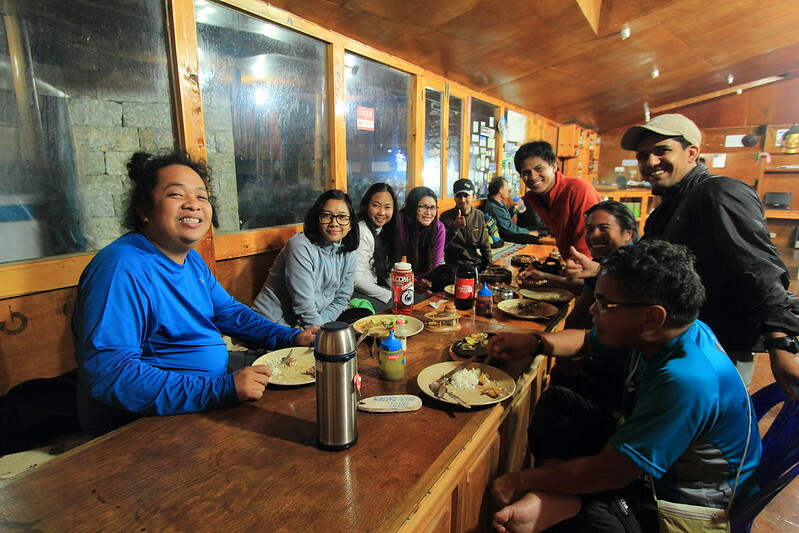 A specific role is given to a person depending on his ability to communicate despite the rapport they can establish with the trekkers. 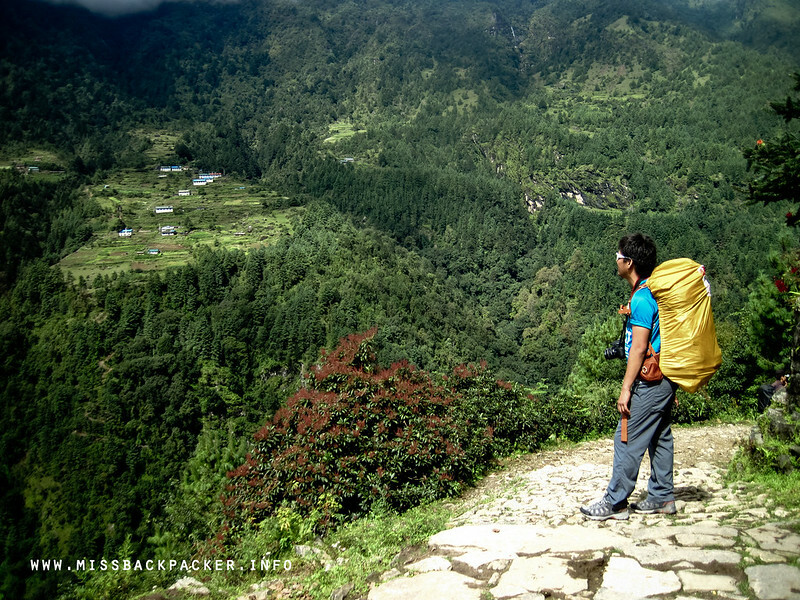 In our case, Bikal, who is a university graduate, is a trekking guide. Saroj is next in line and, in my opinion, needs more practicing. We all loved Rambo but he speaks very little English. I hope that our three porters Kiran, Man, and Manu also learn more English so they won’t be stuck being a porter forever. We had a short exchange of hellos and how are yous and then our journey begun. 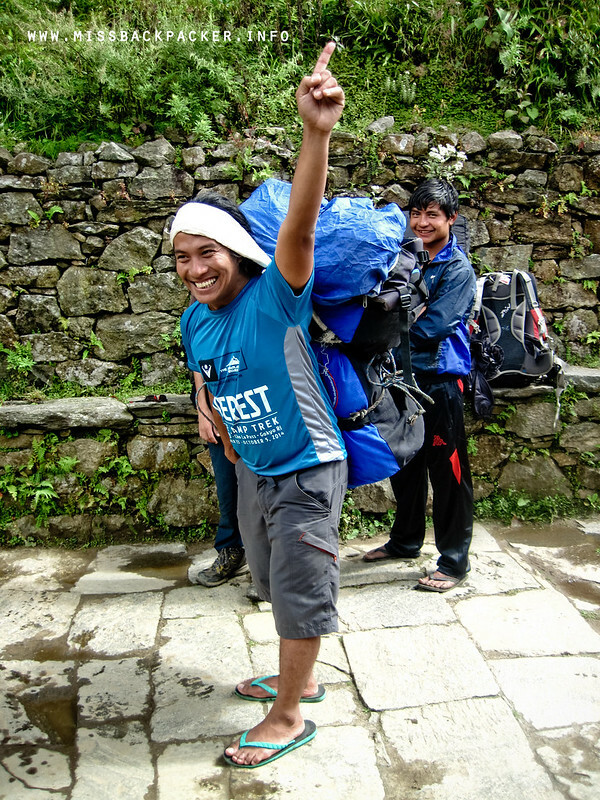 Migs trying out the load of one of our porters. Heavy, eh? That’s Rambo at the back. We haven’t walked that far yet but we already counted three helicopters flying above us. Bikal said they could be transporting goods and supplies to some villages but they also might be rescuing some trekkers in need of immediate medical assistance. What a way to welcome us! These are zopkios, a hybrid yak and cattle. The first parts of the trail were all downhill. I said to myself, “I thought we’re trekking to Mount Everest? Why are we descending?” Then truth struck me. Ohemgee. We’re going to pass this same trail on our way back from the base camp. I really hate it if the trails are going upward during the last parts of my hiking. 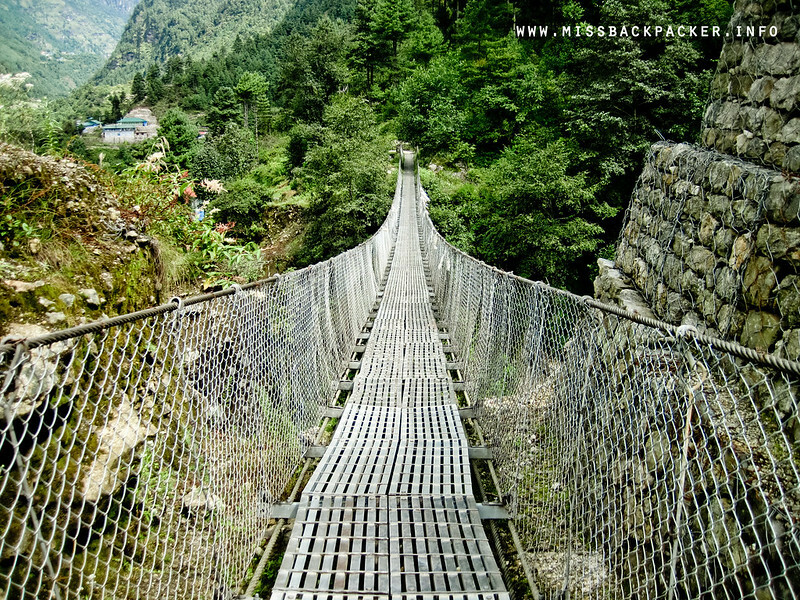 The first suspension bridge on your way to the base camp. Trekking to EBC is pretty much the same with how trekking to ABC works. The only difference, according to the porters and guides we’ve had the chance to speak with, Annapurna is more physically challenging because of its lots of killer ascents and descents but EBC is also taxing in its own right. Higher elevation, higher risk of acquiring altitude mountain sickness (AMS), and longer days of trekking. When you see prayer wheels, walk past on the left side while turning the wheels on a clockwise direction to cleanse your soul according to Buddhism. The first day didn’t really require any strenuous walking. We only spent 4.5 hours with lots of long rests. We didn’t want to tire ourselves that much since it was just the beginning of the long trek. During this day, we’ve also had our first encounters with yaks, zopkios, suspension bridges, stupas, and prayer wheels, which all reminded me of how fun our trek to ABC was. But when we reached our teahouse Hotel Beer Garden in Phakding Village, it became a different story for me. Welcome to the village of Phakding. After eating lunch, we wanted to take advantage of the sunshine so we all took a bath in our assigned rooms, washed our clothes, and hung them outside the teahouse where the sun rays are. It was just around 2PM that time but the cold temperature sneaked into me and the next thing I knew, I was already chilling and feeling dizzy. 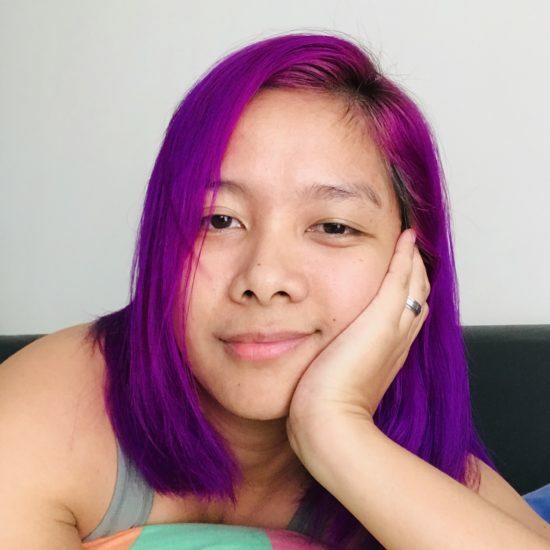 When Rowjie asked me to go back to the common area where all my friends were, I pretended that I wanted to sleep when in fact, I wasn’t really feeling okay. I napped for a couple of hours thinking that it will help ease my headache and when I woke up for dinner, my condition was worse. Ohknoes. I might be taking too long that Rowjie followed me to our room to check what was going on. The scene he saw shocked him—his wife trying to conceal her crime. What makes the matter worst was that Dwine wanted to take a bath in our room because the hot shower wasn’t working in his. To sum it up, I really had to clean the carpet and make it look as if nothing had happened. And that my friends, how my first day went.